Neil Smith kicks off this month’s theme on Napoleon’s Generals by taking a look at some of his favourites and how they should be represented on the tabletop. RULES SHOWCASE: WHAT A TANKER! The Too Fat Lardies came to see us to show off their new World War Two tank combat game. Rupert Mitchell offers once more his snapshot of the plastic figure sets that can be used to support this month’s theme. Gary Faulkner offers some hints and tips on how to get the best from MDF kits. Adrian McWalter presents us with information on one of the most well known of Napoleon’s Marshals, the ‘ruddy faced’ hero who played such a major role within and without the French Empire. Our report of the world’s biggest wargames show, featuring all the best demo and participation games. Colonel (Retired) Bill Gray takes a look at a general who rose from humble beginnings tothe dizzy heights of the Empire. We take a look at a number of companies that provide a variety of useful or different aircraft for WWII aerial gaming. 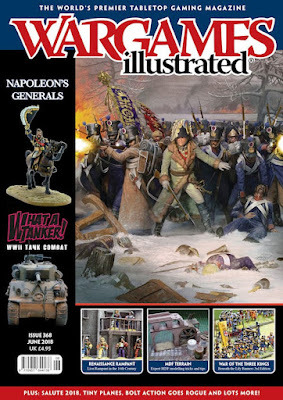 Dom Sore explores the options for those looking to place Napoleon and his Generals at the heart of their tabletop battles. Steve Beckett delves into the world of British comics once more, taking us on a journey to a planet riven by war and a warrior born to fight upon it. Stuart Mulligan & Oliver Green use their period expertise to provide some thoughts, rules and army lists for converting the popular Lion Rampant rules for the early Renaissance. A 12mm hex-based classic Lord of the Rings refight. DÓNDE ESTÁ EL HOMBRE DORADO? Nick Buxey picks up on his previous articles on using Studio Tomahawk’s Congo rules for adventuring along the Amazon, and this month presents his ideas and accompanying rules, for gaming with Congo using Conquistadors. The latest iteration of the popular Beneath the Lily Banners rules by The League of Augsburg is here, complete with a new thematic focus and simple changes that help to save time spent leafing through the book during a game. What was your first battlefield visit?